Nanette Lepore Two Piece Swinsuit - Perfect For Inverted Triangle Shapes. Condition is Pre-owned. Beautiful tropical colors. The top is a medium and the bottom is a small. Worn only once or twice. In excellent condition. Retails for over $125. High-end suit. Exuding festive appeal, the pieces from this collection will be perfect additions to your swim wardrobe! SIZE : M, GOOD FOR DRESS SIZE 8-10. Stretch waist hugs the body. Moderate rear coverage. Hand wash, line dry. BRA IS SIZE L, BOTTOM IS SIZE : M, WILL BE GOOD FOR DRESS SIZE 8-10. Lining: 84% nylon, 16% elastane. 88% nylon, 12% elastane. NANETTE LEPORE. Ties at neck and back for an adjustable fit. Size: Small. New and never worn! Self: 88% Nylon, 12% Elastane. 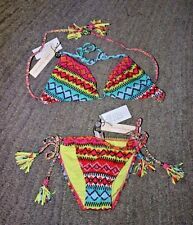 Beautiful Nanette Lepore Talavera two piece swimsuit. Never worn. New with tags . Paid 168 plus tax . Dies not fit and I can’t return it . NANETTE LEPORE. 2pc Swimsuit Tankini. 72% Nylon, 28% Elastane. Color: Black & Multi. For sale is Nanette Lepore Bikini. Bikini bottom Size Small. Bra with Removable pads. Beautiful hot pink with orange-72 % Nylon, 28% Spandex. Bikini cut. - Moderate coverage. Care: Hand wash. Self: 72% nylon, 28% Lyrca elastane Lining: 87% nylon, 13% elastane. Fiber Content.